Better communication means better care. When clinicians communicate easily, they can diagnose and treat patients more quickly. Clinicians get lab results as soon as they’re ready. They can easily access vast medical databases from their smartphones, tablets and other mobile devices. Ultimately, patient outcomes improve. With SecurEdge Networks, clinicians are assured of Wi-Fi coverage, regardless of where they go. We deliver fast, secure roaming, so that even voice and video communications continue without pause, even across IP subnets. Smartphones support both voice and data, but voice calls can drop if quality of service (QoS) is enforced by device instead of by application. With SecurEdge's application-aware QoS, hospitals can identify and prioritize latency-sensitive voice and video communications over less critical traffic. •Secure communications across many different mobile device types. SecurEdge’s role-based access control enforces corporate security policies per user, even across multiple devices and SSIDs. This same role-based security ensures that mobile devices on the network are owned by the clinician or hospital. •Connect remote specialists to the hospital. The cloud-based Virtual Branch Network (VBN)solution from SecurEdge Networks extends secure enterprise-class networking to all users, including remote specialists, interpreters and physicians working from home. With our VBN, services like content security and user-access policies are handled in the data center. At the same time specialists get immediate, secure remote access to the vital resources as if they are on-site. 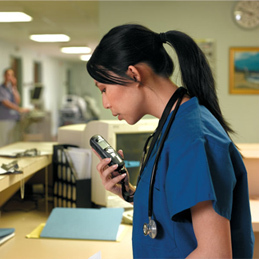 Are you looking to improve your clinical communications? As one of the top Wireless Networking specialists in the United States, we design, deploy, manage and secure wireless networks for schools, hospitals and large enterprises. Contact us today for a free consultation or free wireless network design.